2 Wanderer - Gorgeous, modern retreat - zero entry pool & stand alone hot tub. New to rental market & only rented 10 weeks/year. Relax in this oceanside retreat, with all the modern conveniences and plenty of amazing spaces to relax by the beach! 4 homes from the beach! 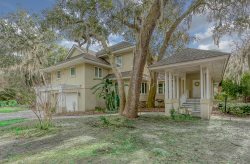 This beautiful four bedroom, 3 bath home is located Oceanside, in desirable North Forest Beach. Fully renovated and decorated in Spring 2019, this home has NEVER been on the rental market. The owner is opening up a limited number of Summer weeks to share with vacationers looking for a lovely, quiet retreat. A very easy walk, the beach access is a only 150 yards away! Bedding consists of 1 King, 2 Queens, and 2 Twin beds. Enjoy relaxing and listening to the ocedan waves on the front screened in patio, or on the back deck overlooking the pool and Hot Tub. Ocean breezes and sounds will lure you to the beach as you enjoy your peaceful Hilton Head beach vacation. Just a short bike ride away are the shops and restaurants of Coligny Plaza, Beach Market, Heritage Plaza and Circle Center. For added fun, play miniature golf or ride the island's network of bike paths. *We will provide FREE pool heat to all renters! This is a great value! Quiet North Forest Beach community, Beach oriented/3 minute walk to the beach, The expansive North Forest Beach is very private & never crowded, Private/fenced in yard with heated fully fenced pool & Jacuzzi is great for a relaxing vacation. High Speed Wireless Internet. Comfortable, stylish furnishings, Sleeps 10 in 4 bedrooms, 3 baths & a Bonus room. Fully stocked kitchen open to Living room area.